How to Build a Survival Kit on Bushcraft Principles. Having been given a copy of John ‘Lofty’ Wiseman’s ‘SAS Survival Handbook’ when I was 13 years old, I spent a disproportionate amount of my mid-teens devising ingenious ways to cram more and more survival kit into a tobacco tin. At the weekend I’d go to the local woods with my friends and we did what all good survivors did – build shelters, light fires and whittle sticks. Whenever I wanted to use something from my survival tin, it was hard to avoid disturbing most of the contents. I’d squeezed so much good stuff in there, I’d created something of a Chinese puzzle. It was difficult to unpack and always impossible to re-pack to the standard I’d managed at home. I’d often resort to putting a few bits and pieces in my jacket pocket rather than back in the tin. I came to the conclusion that less was definitely more. Later, I also assembled the components Lofty suggested for a ‘survival pouch’. I persevered with the tobacco tin survival kit and survival pouch for years, carrying them with me “just in case” while hiking and on many camping trips. While I used some of the items from the survival pouch on a daily basis, I found myself packing survival kit then packing many items that replicated the functions of items in the survival kit. The replication of kit between survival kit and day-to-day kit continued to bug me. Then I went through a lightweight backpacking phase and really pared down everything I took with me. In the end, I left much of the survival kit at home and relied solely on the little ‘bubble’ of safety created by the modern camping equipment I carried with me. After a while I got bored with being in my bubble. I wanted a closer relationship with the environment I was visiting. It was then I sought out Ray Mears to learn what he was calling bushcraft. 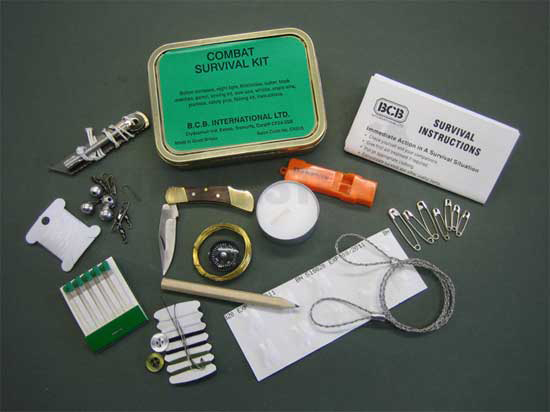 I still love the concept of the tobacco-tin survival kit. There is so much function in such a small package. The ‘Combat Survival Tin’ makes perfect sense in the context of the soldier, who has much ammunition and other heavy equipment to carry. As outdoors people, though, we are allowed a different equation. We choose to enter wild places for the sake of being there. We can take with us equipment that allows us to live there for an extended period of time. My experience of wilderness travel and living outdoors for weeks or even months at a time, combined with a knowledge of bushcraft, has changed my perspective on my own personal ‘survival kit’. My ‘bushcraft survival kit’ is designed to be functional in itself. It is a stand-alone entity. To this extent it pays homage to Lofty’s doctrine. It is also designed to dovetail with my other basic wilderness equipment with little overlap, except where valuable back-up to critical wilderness equipment is provided. Most important, the components are assembled with day-to-day use in mind. So, rather than including a couple of scalpel blades, I include a good quality pocket knife; rather than including a small flint striker, I include a full-size Swedish Firesteel; and so on. If you are living in the outdoors, rather than merely visiting (in a bubble), then the equipment you have for living there is largely your survival equipment. With a few exceptions of kit intended purely for emergencies, this equipment will be used on a regular basis if not every day. 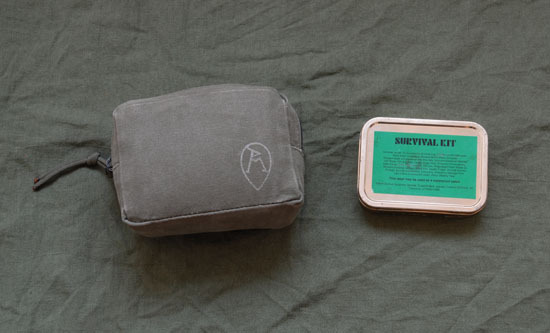 Bushcraft Survival Kit and Combat Survival Tin. Photo: Paul Kirtley. 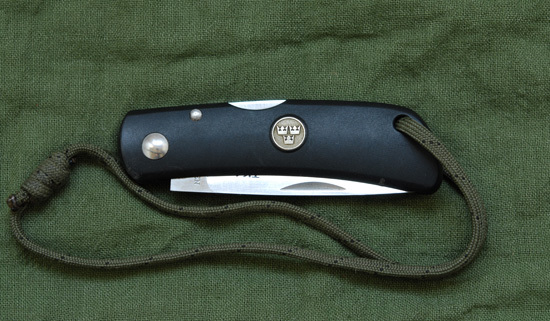 A quality lock knife such as the Fjallkniven TK4 is a valuable tool. Photo: Paul Kirtley. As described in my article ‘Essential Wilderness Equipment‘, the Swedish Firesteel is the most dependable aid to fire-starting. They last a long time so you only need carry one with you for both day-to-day use and emergencies. Also described in my article ‘Essential Wilderness Equipment‘, the Fjallkniven DC4 is a portable and efficient whetstone that is easy to use. Blowing a whistle uses less energy than shouting for help and the sound carries further. Carry one at all times. A model that is made of tough material and has no moving parts is reliable. The Fox40 Micro meets these criteria and is very loud. A small LED light kept on your person is handy for when you need a little local illumination. It can make jobs that would otherwise be difficult in the dark easy; for example, changing the batteries of your main torch. I use a powerful LED torch as my main torch but it is overpowering for jobs that only need a low level of light. The Photon ‘Freedom’ Microlight has a dimmer control so you can bring the light level up gradually to the level you want – ideal for night-time map reading without losing too much of your night vision. LED microlights typically have a long battery life so I don’t carry a spare battery. If you wanted to carry a spare, it would be just as easy to carry a spare microlight. I carry a Photon ‘Freedom’ Microlight and a Fox40 Micro whistle on a cord around my neck. Invaluable for a multitude of tasks from bow-drilling to making improvised snow-shoes, you should always have a hank of paracord with you. Genuine 550-lb breaking strain paracord has a number of internal strands that can be stripped out and used for tasks such as sewing repairs or making a fishing line. My first choice for day-to-day fire-lighting is the Swedish Firesteel because it lasts such a long time – 12,000 strikes according the manufacturer. Matches, by contrast, get used up relatively quickly (imagine carrying 12,000 matches!). For some firelighting situations though, matches make your life easier. For example, lighting match-stick thickness kindling (think small Spruce (Picea) or Hemlock (Tsuga) twigs), is much easier with matches when you have no tinder on which to drop a spark. I reserve most of my matches for an emergency. If I do use any matches, I replace them as soon as I can. Strike anywhere matches are preferable to safety matches. Keep them in a watertight container packed with a little cotton-wool to stop them rattling. A lighter is useful for fire-lighting and, unlike matches, will work after a dunk in water. It’s also useful for day-to-day jobs such as melting the end of a length of paracord to prevent fraying. A good quality blow-torch lighter can be used for fixing equipment and finishing off creme-brulee! Waxed paper of the sort that is like thick card is very dependable tinder for establishing a fire. This material can be lit directly with matches or a cigarette lighter. Alternatively it can be scraped up with your knife in a manner similar to birch bark and ignited with a spark from your fireflash. Due to being infused with wax it repels water. Again I keep this for emergencies. A good quality torch is worth the expense, particularly if you camp outside of the summer months. I like a torch with a powerful beam that can be used for route-finding in the dark. This also makes it a very good emergency signaling device. A torch that is waterproof is ideal for wilderness use. I find the no-compromise Surefire ‘Outdoorsman’ flashlights very good. This model’s construction makes it extremely tough. It is waterproofed with rubber O-rings and runs on only one CR123A lithium battery. Lithium batteries are lighter than alkaline batteries and work better in low temperatures. I carry 3 spare batteries. I also carry a strap that converts the flashlight into a head torch. Overall it’s a tough, versatile and high-performance combination. 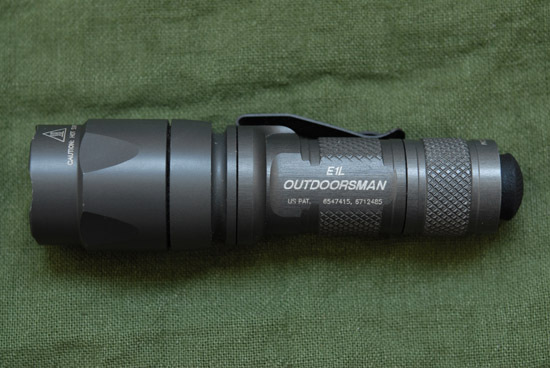 The Surefire E1L Outdoorsman: A sturdy torch with no-compromise build quality. Photo: Paul Kirtley. Iodine or chlorine water purification tablets are compact and easy to carry. Carrying a chemical treatment for water gives you an alternative to boiling. Iodine tablets are my first choice. Iodine deals with the tougher pathogenic organisms such as giardia and cryptosporidium, whereas chlorine doesn’t. Unfortunately due to the European Biocides Directive 98/8/EC, iodine has been unavailable for sale within the EU as a treatment for drinking water since October 2009. Iodine is still available outside of the EU. Please note that Iodine must not be consumed by those with thyroid problems or by women who are pregnant. Resealable bags have many uses. As long as the bag is not punctured it can be used for storing water when you are without a water bottle. If you are without a metal mug or pot in which to boil water, you can use your chemical water treatment in the plastic bag too. A plastic bag is also useful for collecting and storing foraged foods such as berries. These are purely emergency items! They can be used to store water and can be protected with a spare sock or similar. Make sure they are unlubricated. Snares are indiscriminate and used incorrectly can cause great suffering to an animal. They should not be toyed with. In experienced hands snares are very effective and, in a survival situation, they can provide you with valuable fat and protein. This is nutrition that can be impossible to obtain from foraging for plant foods and fungi, particularly during winter and spring. Moreover, snares work for you while you do other things. Some brass snare wire, or snares already made up for the most likely small game, are a sensible and realistic addition to a survival kit. Snaring is illegal in many jurisdictions and requires a licence in others. Survival fishing is about catching fish. Your fishing kit should help provide dinner rather than just a pleasant day by the river. Pack kit that you know how to use and that has a wide application. The best return on your time and energy is provided by passive methods of fishing such as night line fishing. In my kit I have monofilament, stainless steel wire for making leaders and an assortment of hooks, jigs, jellies, and split shot. I put all this in a small tin to keep the hooks safe and prevent any of the small items from becoming lost. Remember you can use the inner cord of your paracord in combination with your fishing kit. Fishing without a rod and the use of a night line are illegal in some jurisdictions. Check before you decide to practice your skills! Survival Fishing Kit. Photo: Paul Kirtley. A few needles, some strong thread and some safety pins. I keep these items in the fishing kit. While I always have a compass in my shirt or jacket pocket, I like to carry a back-up compass. The favourite of survival kits is the button compass. Navigating with any precision with a button compass is difficult. 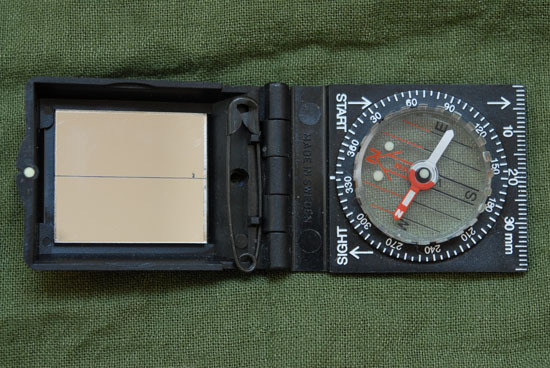 A miniature base-plate or sighting compass is ideal. The Silva ‘Ranger 27’ is a small sighting compass that is fantastic as a back-up. It functions like big brothers ‘Ranger 16’ and ‘Expedition 15’ and is capable of precise navigation. Like its larger brethren, the ‘Ranger 27’ has a sighting mirror. By reflecting sunlight, a mirror can be used for emergency signaling over large distances. Silva Ranger 27 Compass: A miniature but fully-functional back-up compass. Photo: Paul Kirtley. A survival bag is a large plastic bag, big enough for at least one person to get into, for use as an emergency shelter or part of a hypothermia wrap. You can cut open two of the three sides and make the bag into a single sheet. This can then be used as a tarp or a lean-to. A large polythene sheet is also an effective way of collecting rain water. Survival bags are typically bright orange so they are visible from afar and easily seen by searchers/rescuers. A gill net is a very unsporting yet extremely effective way of removing fish from water. Fish swim into the net and become stuck and then entangled as they struggle. It is a passive method of fishing, allowing you time and energy to attend to other priorities. The use of a gill net is illegal in many jurisdictions, including the UK. In mosquito-infested regions, a head-net is essential if you are not to be driven to distraction. A head-net has several other uses including fishing and melting snow for drinking water. Many head-nets are impregnated with insect repellent, which can be harmful if consumed (by humans as well as insects). For generating drinking water from snow you should use a net that is untreated. From a survival standpoint insect repellant may seem like a luxury at first glance. Biting insects can make life a misery though. They can cause so much distraction that you don’t pay attention to dangers or that you injure yourself, particularly if you’re using cutting tools. As described in ‘Essential Wilderness Equipment‘ a small first aid kit capable of dealing with cuts and other minor injuries is prudent. Adding a substantial dressing allows you do deal with more serious injuries. Military dressings are highly absorbent and come in a waterproof wrapper. Assuming you are not injured, your basic needs are shelter, fire, water and food, not necessarily in that order. The order will change depending on where in the world you are and what condition you are in. Your survival priorities can be addressed by remembering the acronym PLAN-M. PLAN-M stands for protection, location, acquisition, navigation and medical. 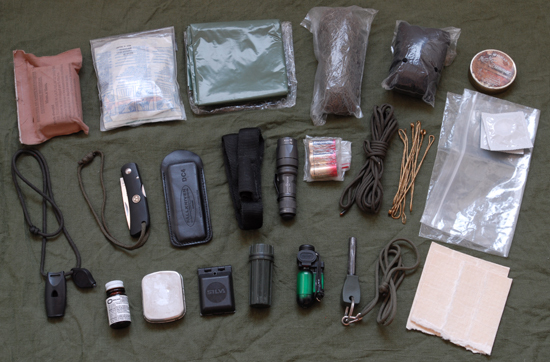 The bushcraft survival kit described above addresses each of these needs in a substantial way, with many of the items of equipment having multiple uses, across categories. Knowledge and skill, however, are more important than equipment and equipment will only be of use to you to the extent you have the bushcraft knowledge and survival skills to use it. Treat every piece of equipment you have as a bonus. The equipment comprising my bushcraft survival kit fits into a small canvas pouch. The fireflash, sharpening stone and cuts kit are the same pieces of equipment as discussed in my article ‘Essential Wilderness Equipment‘. These and some of the other contents of my bushcraft survival kit are kept on my person when out in wild country. At other times they are kept in the pouch. The only places the items are allowed to be are either on my person or in the pouch. It’s then very easy to grab the pouch – either when packing for a trip or in an emergency – and know you have everything. My bushcraft survival kit functions as a survival kit in its own right. But it also dovetails with other wilderness bushcraft equipment. The bushcraft survival kit pouch and water bottle pouch can be added to a daypack along with some food, a warm layer, hat, waterproofs, maps and compass and you have everything you need for many day-hikes. In wild and remote country, you should certainly add some more serious cutting tools such as a bushcraft knife and folding saw. You would probably also want to add a more substantial wilderness first aid kit. These are the basic building blocks of my bushcraft and survival equipment. Taking a modular approach really helps to make sure you have everything you might need as well as cut out excess “just in case equipment”. The building blocks of my bushcraft and survival equipment. 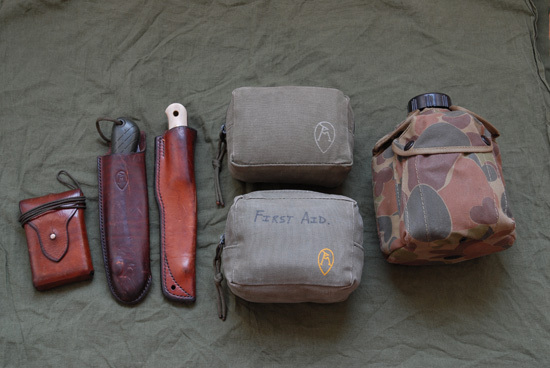 From left to right: Compass; folding saw; bushcraft knife; bushcraft survival kit (top pouch); wilderness first aid kit (bottom pouch); waterbottle and metal mug in pouch. If you agree, disagree, have questions, or have other equipment you would add to a ‘bushcraft survival kit’, let me and other readers know in the comments section. Essential Wilderness Equipment – 7 Items I Never Leave Home Without. A couple things I’d add would be a spool of dental floss and a small awl. Dental floss is a nice strong thread with a multitude of uses and it comes ready wound on a nice neat spool. The awl would be used when you need to repair your kit and you can’t get a needle through the material. Good to hear you enjoyed the article. You’re right – dental floss is good stuff! An small awl is indeed a good idea for a repair kit. Steve, these are a bit more specialist and knowing you I suspect may have seen them before: a handy item for a serious repair kit is the Speedystitcher Sewing Awl. Your survival kit should include a survival mirror. I’ve epoxied a Swedish Firesteel to one side of my mirror, a magnesium rod to the other side and a diamond knife/fish hook sharpener to the bottom. The mirror is on a lanyard with my Tanto combo blade folding knife and a high intensity whistle with a small Suunto urethane’d to it. Simply integrating a number of essential tools together. My tinder is small pieces of paper towel rolled into a ball bathed in acetone stored in a small plastic container. They burn for 30 to 45 sec. – the best starting tinder I’ve come up with to date. The Suunto is a compass. It sounds like our routes into bushcraft were really very similar Paul. I remember being very impressed by a book called ‘Survival for Young People’ in the mid 1970s which inevitably led me to Lofty and then finally to Ray. I know exactly what you mean about the frustration of repacking a tiny tin! Much too much hassle, your modular approach is the way forward. I’ve carried a UK military wound dressing since it was the only compulsory item to carry on the Outward Bound course I was on in 1980. Useful & bombproof. The rest of my kit is very like yours – but then it was you who taught me! I’ve added a small roll of duct tape, some zip-ties and a Thermarest repair kit to mine for running-repairs. Plus a couple of mini-carabineers for hanging torches etc. I went down exactly the same route too. Possibly fueled by a certain popular film that came out at that time also. The Eighties were great;Survival, Weapony & Techniques magazine, Lofty Wisemans book, Duncan Dares with Lofty and the old survival tin and cheap Chinese SAK. No doubt some folk had that awful £5.99 survival knife too, but I’m not admitting to that. What is certain, is that my local woods must have a ton of old bits of my tins contents littered about the place, as it was forever bursting open it was that jam packed. I’ve toyed with the idea of a bigger kit like this for some time as it was something that I grew up with. But I know that when it came to sorting out my kit for a bimble, I’d leave it behind and carry just what I needed. I may look into this smaller modular system again for extended journeys and expeds. I’ll admit to having a cheap R@**o-type knife that cost very little back in the 80s. I think it was £8.99 though, not £5.99 :o) The steel was so soft that when I was building a shelter and tried to chop down a small tree, the blade went from being straight to curving off to the left! That’s exactly the one! Believe it or not I still have the 10-grit sharpening stone. I found it in a box of old survival-kit tat the other day. The rest of the knife is long-gone. Yes, you guys had fun using your kits last year. Matt Batham also just commented on this experience in the comments section of the ‘Essential Wilderness Equipment’ article. Interesting that a few of you have commented on adding items for repairs. I think a repair kit for an extended journey is a must. It’s amazing what can be achieved with duct tape! I forgot about duct tape. That’s a kit essential. The British Army is held up by that stuff. Great article. Only comment is that even with a fire steel fire making can be really difficult so, as always with any skill that you may actually be relying upon to save your bacon…. practise practise practise. I have two fire steels, one that I use and practise with and one in the kit to be there in perfect condition should I ever need it. Knowing that you can use everything (legal) effectively will add to your confidence and positive attitude which could be the difference between success and failure. Absolutely. Skill and knowledge are paramount. Skill comes through practice, as does confidence. A great list…..I always tend to stick a bit of tinder in any kit , more I think just for moral. I remember you showing me a little ‘green box’ with a sealable lid in which you carried some sharpening stones ?? I carry two as part of my ‘kit’ , one has firelighting necessities in and the other a sharpening kit , fishing kit and snares. They are so useful. Superb blog – great articles.. I very much liked your post and it sure would come in handy someday. I try to spend as much time in the woods as humanly possible and you just never know what can happen. I have been struggling for a few days on the matter of matches. I understand the need for a backup to the firesteel for convenience lighting some kindling. But if you already have a firesteel and a lighter, why bother with matches? Then it finally occured to me. Maybe obvious for all but still sharing. When it is really cold the lighter will loose its pressure very quickly. Even if you keep it warm close to your body, once you get it out to use it you might only have a few seconds of pressure. That’s where, in my rationale, matches have a role to play. Do you see other distinctive advantages of matches? They are probably marginally easier to light with reduced dexterity than a classic lighter. To push it even further: do lighters and matches have any benefit over the firesteel – greased cotton wool combo? I never tested greased cotton wool in very cold and wet environment. Good questions! Matches do have some advantage/convenience value. A fireflash needs suitable tinder to spark onto. For example, small, dead sticks from the lower part of a spruce tree or similar can be lit directly with a match but not a firesteel. While it is possible to light a featherstick with a fireflash, you need to be good at making fine feathers and be precise enough with you firesteel to make it work. Lighting feathersticks directly with matches is much easier. Lighting kindling or tinder inside a stove in a cabin or heated tent is easier with matches than a fireflash. These points also apply to a lighter. The problem with lighters in very cold environments is not so much a lack of pressure but their potential to freeze, crack and then leak. This can pose a significant hazard when the fuel vaporises after entering a warm cabin or tent. Matches work well in the north. Following on from your comment about lighters; for many years I’ve carried a ‘Blueflame’ lighter, one of the blowtorch types which is much stronger than the normal kind. I find the long narrow (and VERY hot) flame is great for lighting stoves & lanterns. Also useful for repairs involving soldering or ‘welding’ fibreglass & plastic. I keep it on a lanyard around my neck, tucked inside my clothes, so that it is kept at body temperature and works well in the cold. It was quite pricey but is now over 15 years old and still going strong! I’ve also just added a comment on your “7 Items” article about reducing the size of rolls of tape. The Gaffa in my survival kit has been wound off the roll and onto a card to give a wide, flat ‘roll’ which takes up less space and is an easier shape to pack in the pouch. Hi Steve, yep I agree. A decent blowtorch lighter is a good investment. Mine is the green metallic-coloured object in the main photo. You used to be able to buy small rolls of gaffa/duct tape in flat rolls as you describe but I haven’t seen them for a while. Cheaper to buy a big roll and DIY though. just one point re the fishing gear, I would swap out the mono for braid, use 60lb and its as thin and can be used for binding, whipping and repairs, the safety pins in your med kit can be whipped onto a fishing pole as eyelets, if you have a small amout of light nylon you can use this with flies that could replace some of your jiggers and jelly worms, flies like “buzzers” can be used alone or baited. a couple of “ranger bands” or innertube sections take up no space and can be wrapped around a lighter or torch, bomb proof firelighting. Thanks for the comment and positive feedback on my blog. Thanks also for the interesting thoughts regarding fishing kit. I think you make some really valid and useful points there. I did use to carry some flies but I found I didn’t use them as much as the jelly/jiggers. But you are right, you should take a variety of kit that you know how to use. Agreed on the inner tube/rubber – very good for firelighting in damp circumstances. As you mentioned, it’s very difficult these days to take some items that are useful survival kit as carry-on luggage on commercial flights. Sharps are the main issue and based on the Civil Aviation Document here, you could still take most of the kit featured in this article as hand luggage. Often people don’t realise you can take one box of safety matches or a single cigarette lighter for personal use. You could also take useful items such as a metal mug, bandana and compass (I carry my compass as hand-luggage anyway as it is less likely to get damaged). In more remote parts of the world, in light aircraft, you may well be allowed to keep more survival kit on your person. Each place has its own rules and circumstances. I think in most cases where a big commercial jet goes down on a major route, you’d be either dead or rescued relatively quickly. The safety briefing on board the flight is easy to take for granted but contains very important information. People underestimate the difference made to survival rates by taking full notice of this information. Information such as not inflating your life vest until you have left the plane if it ditches. People have ignored this and died as a result. An obvious point but one that people don’t always think about is, in case of a fire while the plane is on the ground, you are more likely to get out the nearer the emergency exits you are. Also if you sit in an aisle seat, you can get out of your seat into the aisle more quickly. Don’t forget your survival gear for modern society either: If you have just boarded a plane but then you have to get off again quickly, do you have everything you need on your person? I always make sure I have my wallet, passport, mobile phone and a spare battery on my person. Make sure your phone is set up for roaming, even if you don’t intend to use it while you are away. If you have these things then you can look after yourself in most non-wilderness settings, even if all your other belongings are lost. A spare mobile phone battery is very useful (sorry iPhone users!). Even in the chaos at Heathrow in December, people were struggling to make alternative arrangements because their mobile phones needed charging. There were queues for the power sockets. Another consideration is what the weather is likely to be at the far end of your trip? If I’m flying to a cold destination, for example, I always make sure I have a warm coat, gloves and hat in my hand luggage, even if I don’t need them where I’m departing from. Then if my hold luggage is mislaid, I’m OK.
Dano, I realise as a regular traveler, much of this will be common sense to you but your question sparked this train of thought and it might be of use to other readers too. If you were going hiking / tramping or backpacking would you use this kit?? Hello Johnboy, the quick answer to your question is it depends where. I’m assuming your query is in relation to the discussions about survival kits going on over on the BCUK forum? If I was on a day hike up Great Gable then I would be happy with the torch, whistle, survival bag and pocket knife (largely for cutting some cheese at lunchtime). I agree with you that if you are on foot with a backpack there aren’t many events – even in wild country – you can come up with that result in the fabled ‘separated from your kit’ scenario. The tough river crossing gone wrong that you mentioned on BCUK is probably the most realistic. There are other modes of transport, however, in remote areas where more of this kit on your person would be a real asset. It’s much easier to be separated from main equipment bags while canoeing for instance. Also someone told me a story about a trip to film a documentary in Siberia. The helicopter landed en route and they all had to get out. Without any explanation the pilot then took off again, leaving them in the middle of nowhere, without their backpacks. They were relieved when several hours later the helicopter returned. There was probably something lost in translation somewhere along the line but it does make you think…. Anyway mate, thanks for visiting and thanks for the comment. As a young fella I also read the SAS Survival handbook and had a ‘tin’ full of stuff. To carry ‘survival kit’ or not that it the question. I’ve been thinking of the type of situations in a non military context where a ‘belt kit’ as per the article might be used. Canoeing is one for sure. Wilderness location film work yep perhaps. Day hunting out of a fixed wilderness base camp might be another one. Undoubtedly there are others but as we agree in addition to a well supplied daysack or Backpack is probably not one of those situations. As you say survival kits are an ongoing topic over on BCUK. Possibly a reality is that for the vast majority of folk.. Not all . The terrain and mode of travel or situation where such a kit might be of use is a pretty rare event. Yes, I agree – we are on the same page. The idea for Woodlore’s canvas pouch did indeed come from the NZ pouches. The books of Philip Holden were certainly part of the inspiration. Based on some photos of the Dip Flat training camp, we buillt a similar timber framed tent-cabin with an open fireplace and chimney stack at one end. It worked very well. I’ll certainly give you a shout if I’m headed south. Keep in touch mate. Aye shout out if work etc brings you this way… I understand one of your former colleagues might be heading this way as well. Yes and he’s a good bloke. Instead of unlubricated condoms (which seem to be hard to find for me) I use oven bags, they are strong and hardy and easily reusable and pack smaller. A large black heavy duty bin bag. I have that will fit into the large wheelie bin (120litre) it has loads of uses from a rain protection, solar still, emergency sleeping bag, floatation device to name a few uses. I still keep a collins gem version of the Lofty book in my bergen wherever I go sometimes to use, other times just as a morale booster. I find playing with little kit great fun, I think it’s down to so many bits of kit being in one place, how would alter your kit for the extremes of environment, desert, Arctic, ocean…..? Camping with my wife also ends up a five star affair. Why she feels the need to take six rolls of kitchen paper and enough cutlery to supply a cruse ship for just two days Ile never know. very interesting post. Thanks a lot for sharing it. As an alternative to the SureFire E1L torch (around £125) I am looking at a 4SEVENS QUARK 123 (http://tinyurl.com/3r4ljde) which is selling for just under £50. It’s also a x1 CR123 battery model. If I decide to take the plunge, I’ll let you know how it is. Please do let us know if you try the Quark. The SureFire E1L is very expensive now. I got mine for about £80 but that was some time ago. I was shocked to see them on sale for around £150 recently. I have seen one site selling the SureFireE1L for less than £90 – http://www.edenwebshops.co.uk/en/pt/-surefire-e1l-outdoorsman.htm. The 4Sevens Quark123 (£49) turned up on Friday (after some initial confusion on how to get it to work, it looks good! I’ll use it for a bit and post an update. Never laid hands on a SureFire so I my baseline for comparison will be a pimped AA maglite (LED bulb and lithiums). Sourced the torch from flashlight-torches.co.uk and they were very helpful. Just a wee bit of critique,As per the water purification tablets-Chlorine Dioxide tablets,ie. MP-1 tablets from Katadyn, they Kill spores from Giardia & Cryptosporidium,as well as Hepatitis-C & any other organic nasties,where as iodine does not,also treated water with the Chlorine Dioxide will taste/smell like that of a Municipal treated water or better,where as Iodine will taste/smell like…Iodine!lol!I’ve narrowed it down over the yrs,& found Iodine’s smell to that of Old rope of the likes found aboard the old tall sailing Ships,1 whiff & you never forget it,for the rest of your life!I know Iodine has the dual purpose of disinfecting a wound but so does purified water,& Iodine has been known to cause tissue damage & Sepsis,where water alone has not,Also have you taken notice to why Iodine tabs come in Non-clear,Glass bottles?UV light kills it’s effectiveness,almost immediately,& once they are opened(the bottles) air also kills iodine tabs quite readily.I have no affiliation with any of the above products,co,etc.,I would like to see Iodine stay where it belongs in med cabinets,faks,hospitals,etc.Paul,All your other gear/technique info is 1st rate & Top Knotch,& I commend you for it,Thanx for having me aboard! Welcome and thanks for your informed critique! I agree that Chlorine Dioxide is a very good alternative. It is effective against all waterborne pathogenic organisms. With sufficient contact time, iodine does, however, kill Giardia. A concentration of iodine of 8mg/l will kill parasitic cysts (other than Cryptosporidium). This is why the tetraglycine hydroperiodide tablets are designed to deliver this concentration. A concentration of 0.5mg/l to 1.0mg/l kills other microorganisms. Yes, iodine is affected by UV light. But so is chlorine dioxide. Chlorine dioxide is also unstable and generated solutions must be used quickly (this is why you have to mix it yourself at time of use). Also it is recommended that the tablet form of chlorine dioxide is not exposed to air, otherwise it will degrade. So, to me it seems that you have to weigh up the smaller size and portability of a bottle of iodine tablets (but lack of effectiveness against Cryptosporidium cysts) vs the somewhat larger size of the two containers needed to employ chlorine dioxide and it’s ability to deactivate Cryptosporidium cysts. I should also clarify that this consideration is for survival kit use. When I travel, I use a combination of micro-filtration (to remove the larger pathogenic organisms, in particular protozoa) with a lower dosage of chemical treatment to inactivate the other pathogenic organisms. Thanks again for your comment and please keep in touch. For starters, I appreciate all your shared insight, knowledge, tips, and stories. I was wondering what kind of pouch that is that you use for your first aid kit. I recently bought a Maxpedition M-1 waistpack for my survival kit and am now on the search for a First Aid pouch. I am a paramedic, and will be bringing just about all the items you listed (plus and minus some). Thanks again for all the effort you put into maintaining such a helpful blog! Nicely-written article. Just wanted to point out that, contrary to what is written in many survival books, iodine is no longer considered to be effective against cryptosporidium. See, e.g., http://www.ncbi.nlm.nih.gov/pubmed/11990150 (concluding “data strongly suggest that iodine disinfection is not effective in inactivating Cryptosporidium oocysts in water”). You might want to upgrade your water purification with chlorine dioxide tablets, which are much more effective albeit more expensive. Thanks for your comment and for the link regarding Cryptosporidium. I should update this article at some stage, with new photos too. Thanks for your comment. I’m glad to hear that you are finding my blog useful. The first aid pouch in the article is a small canvas pouch based on the pouches issued to deer cullers in New Zealand. They aren’t particularly well made; I’ve had several and the belt loop tends to pull away from the main body of the pouch. Also the internal seams are unfinished and quite messy. I’ve discovered there is someone on Ebay selling a similar unbranded pouch made in Cordura, with much better stitching and finished seams. I’ve just checked and there don’t seem to be any listed at present. I’m currently testing a couple of these out and so far they are proving very good. I’ll post my findings when they have had plenty of wear. I have to say that for the past couple of hours I have been hooked by the amazing articles on this site. Keep up the great work. It really is very useful! It’s great to hear that you got so much out of this site already. I’ll do my best to keep it up! what knot have you used on the lock knife cord & the lanyard for your whistle / micro light? On the knife lanyard it is a double-fisherman’s knot and on the whistle/microlight lanyard it is a single-fisherman’s knot. Both tied with very short tails. They never come undone. Also, after recently getting my ‘Knife and Axe’ certificate at scouts, i was looking for a good sheath knife and was wandering if you knew of any that weren’t too expensive. Thanks for your comment. When you write that you can’t find a suitable container, do you mean the pouch or the metal tin that Lofty suggests? There are many military belt-kit pouches that would be suitable and the standard aluminium mess tin would work well as a container. You used to be able to buy a non-stick lid for them that, in combination with the tin, created a very sturdy box. What’s your budget for a sheath knife? Great Post this!! I also was a junior Wiseman SAS ‘Tinner’. Katadyn tabs are tiny and foil packed so i’ve just packed a half dozen in my ‘pouch’. bigger problem for me was a collapsble bag to treat the water. ended up using 1 intended for food storage but not ideal – doesnt pack small enough, any ideas? Also can you recommend a good belt clip type pouch? thanks again this is addictive reading!! As for the collapsible bag, it’s always a compromise. If you use a food storage bag, they need checking regularly for holes that wear into them from other kit. I have some heavier duty zip-loc style bags that hold a couple of litres but I can’t for the life of me remember purchasing them. I think a client from a course sent them to me. As for belt pouches, there are lots on the market. If your thinking of making a Lofty type survival pouch then something that is about the same size as a mess tin (with lid) works well. If it rattles around a bit, you can always stuff an extra survival bag, rubble sack or similar in between the mess tin and pouch to keep it all tight. For good quality zip-pouches and compartmentalised pouches, look at Maxpedition or BlackHawk. There is a Collins Gem version of Lofty Wiseman’s SAS Survival Handbook available. It’s not waterproof but you could easily put it inside an Aloksak to keep it dry. Thanks.What do you think about the ‘survival straw’ type filters? I believe they only weigh about an ounce – are they worthwhile as a back up? Something else i have in my kit are 3 stuck together ‘Magic Candles’ – you know the kids birthday kind. They do go out in a real gale but in normal windy conditions they keep a flame well. Survival straws are certainly better than nothing and can be reasonably effective in removing many water contaminants. Their drawback, however, is lack of contact time. Any sterilisation which requires a chemical agent (such as chlorine, iodine or chlorine dioxide) requires contact time between the chemical agent and the pathogenic organism. If you are drinking straight from an inline device, then contact time is minimal. Great post, I carry similar items, and your ideas of condensing and not repeating items has had me think about my kit set up. I am new to your blog, and I don’t know if you have researched it or posted anything about it, but duck tape, among it’s many uses can be used as a fire tinder. I don’t recommend using it on normal circumstances,(burning adhesive/chemicals into the environment) however in damp and wet conditions a 3ft. section randomly wadded up in a ball (not a tightly) will burn for approx. 4-8 minutes alone, giving you extended flame to get a fire going in a survival situation in damp/wet conditions. I keep a 3ft. section wrapped around a lighter. If you have not tested it, I highly recommend it. I also liked the post from the guy about wrapping duck tape around a card to save space. One other item I keep is a 4mm. 50 gal. drum garbage bag. My kit is on me at all times, and if my rain gear is separated from me, or i did not bring it on a day hike etc. It is a good survival rain wear to keep my core and upper legs dry. In a survival situation it can also be stuffed with leaves,grass etc. as a water proof barrier between you and the cold wet ground, to provide some much needed insulation. It’s not perfect, but it beats nothing at all. It stuffs easy in my small survival kit,(very similar in size to yours) and for the “tin carriers” I used to fold it up and rubber band mine to the outside of the tin. These are two multi purpose items that take up very little room. I hope you will consider them, I look forward to your comments and critiques. Keep up the good posts. Hi Paul, first can I congratulate you on making Frontier the success it is. We met back in 2010 on the Woodlore WEM2 course. This is more of the survival tip really. If you are stuck for some fine kindling and are wearing clothes more from fibrous (ish) materials (cotton derivitives, but equally synthetic fibres), you can get kindling from them (similar to the pond reed stuff). Simply take your knife, hold it at 90 degrees to the material. Making sure the matrial is taught, drag the knife back and forth. ‘Fluff’ will begin to appear as you drag the knife back and forth, which will take a spark. Obviuosly this has doen sides, but good in a pinch. Yes, I remember you well. You certainly added some value to the discussions around cell biology and immunology. It’s good to hear from you. Thanks for your congratulations. I hope all is going well with you too? Are you still involved with the cadets and DofE? Hi Paul..great articles. Clear, easy to understand and follow. I learn something every time i read one!! Thank you Mel, that’s kind of you to leave feedback. I’m glad you find my articles useful. Yet another good write up thank you. I did go down the survival tin route myself and used the book “no need to die” by Eddie McGee to make one of many kits that I used, I have also got the SAS survival handbook in the Collins gem version, I have since been doing roughly the same as you have done with my kit and most of it used to be in my combat jacket things like water bottles ect were carried on our belt kits, the kit that was carried in my jacket was used when on exercise, I also carried braid fishing line on a small sewing bobbin as part of my fishing kit/ repair kit along with a sail makers needle number 16 and a couple of smaller needles, as already mentioned duct tape is very useful for repairing different things and I carry some wrapped on to a credit size plastic card. In the north (I’m from Canada) we never go anywhere without some kind of pot. It’s hard to get drinking water at -40C without one. I’m a huge fan of strike anywhere matches, but when guiding or teaching we usually light fires with lighters. We wear them around our necks on a lanyard to keep them warm. Just some thoughts from over across. Thanks for your comment. Yes, I agree regarding the importance of a metal pot generally, not just in winter. I would argue they are even more important when there is no snow on the ground as you can then always boil water as long as you can make fire. If you haven’t seen my article on Essential Wilderness Items, then you’ll see how high up my list a metal mug is! I also agree with the importance of keeping cigarette lighters warm if you take them out in the cold. Bic type lighters contain butane, which while it won’t freeze (freezes at -140 Celsius), its boiling point is -1 to 1 Celsius, so if your lighter gets cold it’ll stop gasing. There is also an allied risk – if you damage the lighter in a pocket (i.e. the the casing is cracked) while out in the cold – you’ll likely have liquid fuel permeating an area of your clothing which will start evaporating when you enter a warmer environment. This is potentially hazardous in a typical winter camping environment when you have candles and wood-burning stoves present. Given I have to travel by air to reach the cold places I go and therefore limited in taking lighters or matches, I tend to just buy matches on arrival, rather than a lighter, given the choice. Nice vids. I will check out more of them. I’ve never seen the “marshmallow” before. Very nice. Back in the day up on Great Bear Lake, NWT, my Uncle Ted while running his trapline would melt snow near the fire in an old sugar sack much like your mozzzy head net method if he’d forgotten a pot. I don’t know if anybody talked about it in here, but you can also use the insect repelent has an emergency way to get a fire. hi paul,what folding saw do you use? I use the good old Bahco Laplander. Just want to say that your guides are very concise and to the point and real easy to understand, thank you. I have been trying to put together an every day bushcraft kit and this guide has given me a great deal to think about. As I always have a folder on my person at all times I have added a leatherman multitool instead. they basically take up the same space and there is a bit more utility (plus you still have the folder clipped to you). I have been using the maxpedition FR-1 pouch and I find it a good size for the kit you have explained here. you should check it out. Thanks for your comment. I’m glad that this article gave you food for thought and that in general my articles are proving useful to you. Thanks for the feedback. I do like Maxpedition kit – well made. I’ll check out the particular model you mention. Great blog and very usesfull.I enjoy reading it. I would like to thank you for the efforts you’ve put in penning this site. I really hope to seee the same high-grade content by you later on as well. what brand and model is the lighter you have in this articel? It’s a Blue Flame turbo lighter. Nice article lots to think about. I also carry a emergency fishing kit but some of the kit is slightly different. The line I use is waxed braid instead of nylon due to smaller diameter increased strength and better wear resistance. I also carry three weed hooks for both fresh and salt water. 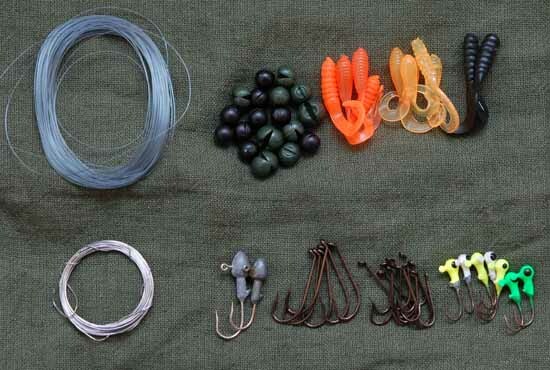 If your kit is limited and loosing even some of your line and hooks is disastrous, then this I find makes sense. Fish tend to like cover and being able to fish for them in weed without fouling can really make a difference. Another piece of gear I take is a very small selection of beads some plain and some flouting along with 6 small swivels. Lines made of multiple hooks can be made more efficient and tangle free with the odd bead or two and a swivel. I do like popup bolt rigs with a leather jacket or red worm on the end. If space allows I also carry a small spinner or Toby with a treble hook just to add to the kits flexibility. All the best and keep up the good work. Forgot to mention I also use circle type hooks they’ve proven themselves harder for the fish to jump the hook than standard long shank hooks. Hey Paul, excellent run-down on some indispensable survival tools. Have bookmarked for future reference. Thanks for sharing! Is your bushcraft survival kit belt mounted? Do you keep your folding knife in it at all times? Do you see any merit in carrying a good folder and a multitool (Leatherman wave) simultaneously? I have a gransfors Bruks Small Forest Axe at home, by combining that with my folder (Doug Ritter RSK Mk1, M390 steel) is there then much of a purpose in carrying a fixed blade/bushcraft knife in your opinion? Can the axe be interchanged with a fixed blade or do they really fulfill different roles in your opinion? Hi paul, I have one of my personal survival kits actually inside a 2″ waist belt that I made. It has a zipped compartment 3/4 the way round the inside with all the items in small resealable bags, a modular system. Having it on my trousers means that if I’ve forgotten it then there’s something very wrong.! Was wondering where you sourced the headband from for your flash light. I have one which came from nite ize. Not sure if they still do them. ager going out overnight fishing or just staying around local lakes and rivers was a great experience, which i understood, have to be repeated. I must say your blog and videos helping me a lot to catch up. I do have a SAS Lofty Wiseman’s book and obviously i am going through same path you had, building a survival kits. I do like the concept of a survival kit, but it is always about efficiency, space, weight and as you said abt replicating items in a main gear and survival kit is also bugging me.lol. Anyway, wanna thank you for educating and regarding your bushcraft survival pouch i would probably add a brew kit!! !salt or/and electrolyte energy drink powder,some emergency food bars or dry fruit/nuts mix, duct tape, emergency poncho, space blanket, mini water filter straw or coffee filters, brightly coloured cotton bandana, a tin foil like thoses one time use baking trays are made from(it s very light and takes very little space, but in emergency can be a very valuable thing),also a multitool with tools such as a saw, pliers, scissors, awl. Offcourse most of these items you would have with your main gear, but can you tell me,please, how and where you carry them usually and what you think of these items in general. Until recently, I wasn’t much into personal survival kits and never felt the need to have one. But a few month ago, I put one together as an exercise. It has to serve 2 needs: being a stand alone kit to have in my daily life pack and also when backpacking containing a redundant and smaller equipment I can have on me at all times when I dont carry my bag. While very good, your kit lacks a key item (to me) a metal tin. I based my kit on a Trangia tin (the smaller rectangular one with handle). I don’t play with tobacco/Altoids tins; if a personal survival kit can’t help me boil water and fix me a hot brew, I dont want it. Maybe you carry a metal mug in your daily routine, in wich case, it takes care of that part. -On folding knives: I chose a multitool instead of a one bladed knife. I want to have at least a blade, a saw and a rimmer in there. Victorinox farmer fits the bill. I don’t mind non-locking blades since I consider and use every locking folder as if they didn’t lock. -Two lights? And none of them is a headlamp? Have you heared about Petzl E-Lite? -On cordage: I tried really hard to work with paracord inner strands. I just can’t. Instead, I prefer 2 separate sources for cordage: one being Dacron cable 125 Kg T.S. (“professionnal” kite stuff) and strong fishing braid 25Kg tensile strength. You can pack an awful lot more of it than the same volume of paracord. … Oh well, This is way too long of a comment! Anyway, I find that in your system (last picture) this is an excellent “block”, very-well tought out, avoiding useless redundancies. I always carry some char-cloth in a tiny zip-lock bag. First let me say I enjoyed your article, and I appreciate your perspective. However, I find your take on the Bushcraft kit unrealistic. I understand that high-quality gear is in fact worth every plenty in the long run, but I spent a few minutes duplicating your kit component choices on Amazon, and not surprisingly, the total cost (with “free” shipping) rapidly approached the $500 USD mark. Obviously all of your gear is well chosen and functional, and I would be proud to carry such kit. But you can understand why most people would opt for a $30 survival tin (or worse, some no- name Chinese toy garbage), rather than spend what is considered a small fortune to a dirt poor pensioner like myself. Thanks for letting me see what a bushcraft kit can look like without pesky budgetary constraints, it’s always nice to see how the other 80% lives. Best regards, Dave. I think he never said that kit should contain exactly those items. It s not easy to build one, and it s always in a state of evolution. Once you build a kit and use it u will see after there is always some room for changes or improvement. The knife Paul uses is extremely expensive i can afford this price only for a well built large fixed blade survival knife not a little folder. I think victorinox trailmaster is much cheaper but still a high quality item and offers more functions. And so on. The surefire torch also very expensive especially in uk. I have chosen fenix e12,it s much cheaper and everyone seems to be happy with it. It s solid, has 3 light modes, and waterproof, lightweight. Paul approach in building survival kit, helped me a lot, and i keep visiting this page sometimes.however my kit is not the same. Ps Forgot to say that Vlad is also right in saying that kit develops over time & gets tweaked every year. Also kit changed depending on environment. No point taking a small fishing kit into the desert.! I’ve been making knives since I was a boy, a skill luckily taugh by my father. I forge in a small fire pit, using an old recycles leaf suspension springs so you can make very good professional looking knives or parangs for next to nothing. I’ve made good usable blades from old bits of rusty farm finds and even nails.!! Only thinking makes it so. Never give up..
Great tips you have share. Thanks for sharing this. What good is a compass without a map? Anybody. This is always in the back of my mind when these discussions come up. A compass allows you to walk on a bearing, as opposed to walking in circles as everyone is prone to do without some form of external frame of reference. Hi Paul, Denny Hughes, here from across the pond. Every thing else I carry on my UTV. The area in which I live has many large wild animals, my dog came within 50 meters of a full size black bear on our walk the other day, and it didn’t want to move until I fired 4 quick rounds in it’s direction. Very informative, Paul! Helpful especially for beginners who want to learn how to survive the wild. I also carry the same items with me. Although, instead of bringing fireflash, I bring water-proof matches and lighter for fire starting. I have ‘Windmill Delta Butane Lighter’ with me. Thanks for sharing your list. That’s a sensible and versatile combination of items. Just what I was looking for! Great guide. Hi, I just recently found your blog and i’m trying improve and compartmentalise my current kit and gear. Could you tell me what size or which pouches you use for your Bushcraft and first aid kit? Hi Michiel, I’ll see if I can dig out the dimensions of these pouches. There are a number of pouches on the market of similar size, from manufacturers such as Maxpedition, Tasmanian Tiger and Black Hawk. Hi, I am making a B.O.B and I was wondering if you could help me. i don’t know what else to put into it, I already have a knife, hatchet, snare wire, flashlights, batteries, water, rope, a knot book, a survival blanket, a basic medical kit, a fold-able saw, matches, magnesium fire starter, electrical tape, zip-ties, and some carabiners. I think a good way to think about it is assessing what you want to be able to do in the environment the kit is for. What skills do you have? What capabilities do you want to kit in your bag to bring? How long will you be relying on the kit (has a bearing on durability and quantities)? How fast do you want to be able to travel (weight of the bag is important in this respect). What conditions will you encounter in the terrain you envisage being in, and what protections do you need while there? Once you start answering these questions, rather than trying to create a general kit for all eventualities everywhere, it is quite easy to reverse-engineer the kit you need from the answers to the questions. Always carry a good quality pocket knife.Very underrated these days I think. Yes, they have remarkably utility in the right hands.